1. Douglas B-26 (A-26) R.O.C. AF, 1/48 48006 1.6EURO(Sold out). 3. 1/72 72012a Northrop T-38 R.O.C. (Taiwan) AF, 4EURO. 4. Northrop F-5B R.O.C. (Taiwan) AF: 1/48 48010 3.7EURO, 1/72 72016 3.7EURO. 5. Northrop F-5A R.O.C. (Taiwan) AF, 1/48 48016 4.0EURO; 1/144 144023 2.9EURO. 6.F-5A ROCAF Part 2: 1/48 48034 6EURO, 1/72 72068 4EURO, 1/144 144048 3.4EURO. 7.Northrop F-5A R.O.C. (Taiwan) AF, part 3, 1/48 48046 F-5A 6.5EURO. 1/72 Northrop F-5A part III, 72077 5.6EURO. 1/32 32001 8.3EURO; 1/72 72031 4.8EURO/72031a(deluxe version) 6.8EURO. 1/48 48051 T-33 part 1, 6.5EURO. 1/144 144030 T-33 Taiwan(R.O.C.AF), 3.8EURO. 9. Lockheed U-2C/R R.O.C(Taiwan) AF, 1/48 48004b 1.7EURO. 10. North American F-100A/F R.O.C. (Taiwan) AF Part 1, 1/72 72026a 5.7EURO. 11.North American F-100A/F R.O.C. (Taiwan) AF 1/72 72045 Part 2, 4.9EURO. 13. Lockheed F/TF-104A; F/TF-104G R.O.C. (Taiwan) AF, 1/144 144027 3.6EURO. 14. Lockheed F-104 ROCAF, 1/48 48037 Southeast Asia camouflage(sold out) & 48039a Sky camouflage, each 5.7EURO. 15.Lockheed F-104G/TF-104G/RF-104G ROCAF in ROCAF Part 2, 1/144 144059 3.9EURO. 1/48 48042 5.8EURO; 1/72 72082 5.6EURO. .
16. Grumman Hu-16C R.O.C. (Taiwan) AF, 1/144 144014 3.4EURO. 1/144 144054 Part 2 4.9EURO. 18. 1/72 72028 North American RF-86F R.O.C. (Taiwan) AF, 3.2EURO. 1/48 F-86F part I, 48047 9.8EURO. 20.North American F-86F R.O.C. (Taiwan) AF Part 2, 1/144 144032 4.8EURO. 1/72 72048 F-86F Part 2, 8EURO. 22.F-5A(F-84G,B-25) ROCAF numbers: 1/48 BDS09 1.5EURO, 1/72 BDS10 1.3EURO, 1/144 BDS11 1EURO. 23.F-104 ROCAF numbers: 1/48 BDS14 (w/ national emblem), 2EURO; 1/72 BDS15, 1EURO. 24. 1/72 72076 Sikorsky H-19 ROCAF, 3.3EURO. 25.1/32 32006 Lockheed F-104G in ROCAF "Sky camouflage" (7th SQ, 11th TFS), 5.2EURO. 26.1/32 32007 Lockheed F-104G(RF-104G) in ROCAF "Sky camouflage" (28th SQ, 12th SQ), 5.2EURO. 27.1/32 32008 Lockheed F-104A/G in ROCAF "Southeast Asia camouflage" , 3.6EURO. 29.1/32 32011 Lockheed F-104A/G Blue numbers for ROCAF, 2.6EURO. 30.1/32 32012 Lockheed F-104A/G White numbers for ROCAF, 2.0EURO. 31.1/48 48058 Lockheed T-33 numbers for ROCAF, 1.7EURO. 32. Grumman Hu-16 R.O.C. (Taiwan) AF "early", 4.9EURO. 33. Grumman Hu-16 R.O.C. (Taiwan) AF "late", 4.9EURO. 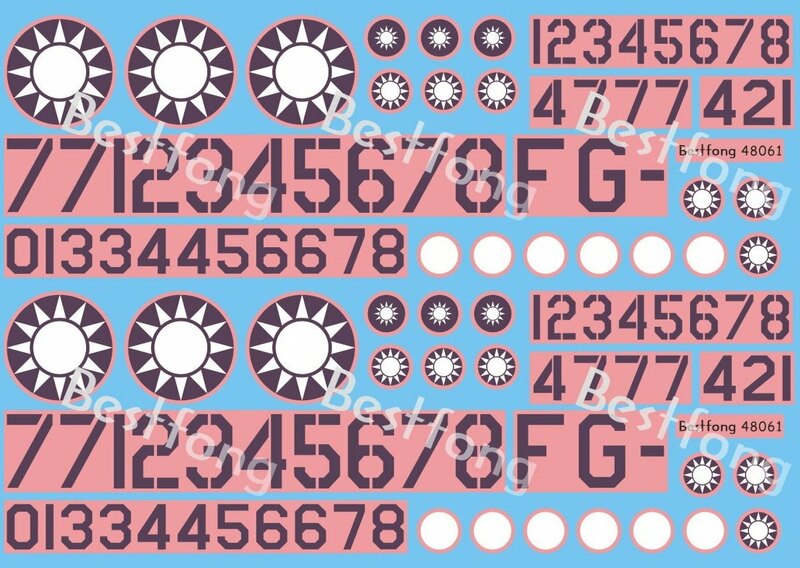 28.1/32 32009a Lockheed F-104A/G Stencils "ROCAF type" , 5.2EURO. 34.F-104A/G in ROCAF Part 4. 1/32 32014 5.2EURO; 1/48 48060 7.4EURO. 35. F-104 early numbers & national emblem for ROCAF. 32015 3EURO; 48061 2EURO; 144063 1.2EURO. 36. 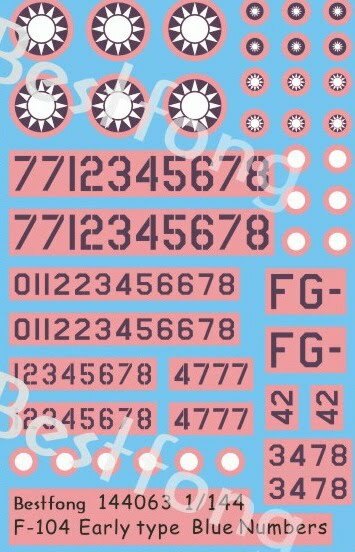 1/48 F-104 Stencils in ROCAF Part 1, BDS20 1.4EURO. 37. 1/72 72091 Republic F-84G R.O.C. (Taiwan) AF Part 2, 5.7EURO. 2. 1/72 72015a Consolidated PB4Y-2 R.O.C. (Taiwan) AF, 4.7EURO. 21. 1/72 72053a Republic F-84G R.O.C. (Taiwan) AF, 6.7EURO. 38. 1/144 144062 F-104A/G in ROCAF Part 4, 3.9EURO. 39. 1/144 144065 RB-57A/D in ROCAF, 2.1EURO. 40. 1/144 144066 C-119 Early in ROCAF, 3.5EURO. 41. 1/144 144066 C-119 Late in ROCAF, 3.5EURO. 42. 1/144 144068 C-119, ROCAF type early stencils, 2.5EURO. 43. 1/144 144070 C-119, ROCAF type late stencils, 2.1EURO. 44.U-6A ROC Army. 1/48 48069 3.8EURO; 1/72 72093 3.1EURO. 45. 1/72 72097 C-119 Late in ROCAF, 5.5EURO. 46. 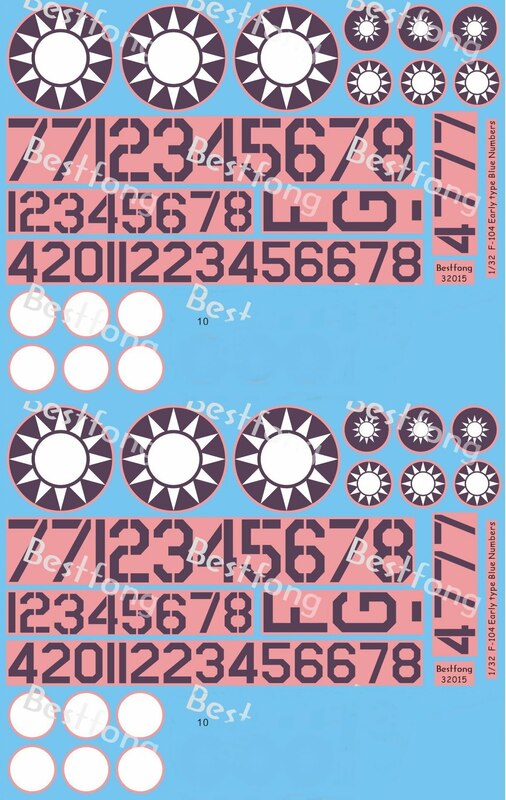 1/72 72098 C-119, ROCAF type late stencils, 2.1EURO. 47. C-123 in ROCAF, 1/72 72099 3.5EURO; 1/144 144075 2.8EURO. 48. 1/144 144072 C-119 in ROCAF Part 3, 3.5EURO. 49. 1/144 144074 C-119 in ROCAF Part 4, 3.5EURO. 50. 1/144 144076 C-46 in PLAAF, 3.1EURO. 51. 1/144 144077 C-46 in ROCAF, 4.1EURO. 51. 1/144 144078 C-47 "May-ling" early in ROCAF, 2.8EURO. 52. 1/144 144079 C-47, stencils, 1.8EURO. 53. 1/144 144080 C-47 in ROCAF, 2.8EURO. 54. 1/144 144068 C-46, ROCAF type stencils, 2.1EURO. 55. 1/200 200002 C-47 "May-ling" early in ROCAF, 3.8EURO. 56.1/48 48084 S-2T in ROCAF, 12.4EURO. 57.MiG-15 defected to Taiwan, 48086 2.8EURO. ; 72110 2.5EURO. ; egg 2.5EURO. 58.MiG-15 Korean War & defected to Taiwan, 1/144 144089 1.9EURO. 59.MiG-15 defected to Taiwan(ROCAF painting), 1/144 144091 1.9EURO. 60.1/48 RF-86F in ROCAF, 1/48 48089 5.6EURO. 61.J-6(MiG-19) defected to Taiwan 48090 4.7EURO. ; 72113 3.8EURO. ; 144090 2.5EURO. 62.1/48 48091 B-24M in ROCAF, 4.1EURO. 63. 1/72 72114 C-47 "May-ling" early in ROCAF, 4.7EURO. 64.Captured Zero in ROCAF, 1/48 48087 5EURO; 1/72 72111 4.4EURO; 1/144 48087 2.8EURO. 65.T-33A in ROCAF (35SQ), 1/48 48092 6.7EURO; 1/72 72116 5.4EURO. 66.1/48 Numbers of F-104 in ROCAF (S.E. Asia Camouflage) BDS48037, 2.3EURO. 67.1/48 BD48094, F-104G in ROCAF (South east Asia Camouflage), 3.3EURO. 68.1/72 C-119 in ROCAF Part.2, BD72117, 5.8EURO. 69.1/72 C-119 in ROCAF Part.3, 72118, 5.5EURO. 70. 1/32 TF-104G in ROCAF, BD32020, 5.9EURO. 71.1/72 RF-84F in ROCAF, BD72119, 4.6EURO.